My students and I take a few minutes every Monday morning to share our weekend ups and downs. It is a wonderful way to break into the school week and to learn about each other. Over the years my beautiful, inner-city, special needs students have taught me invaluable lessons about the power of imagination, courage and resilience while telling about their lives at home. They have also taught me about the true pedagogy of reading comprehension instruction. 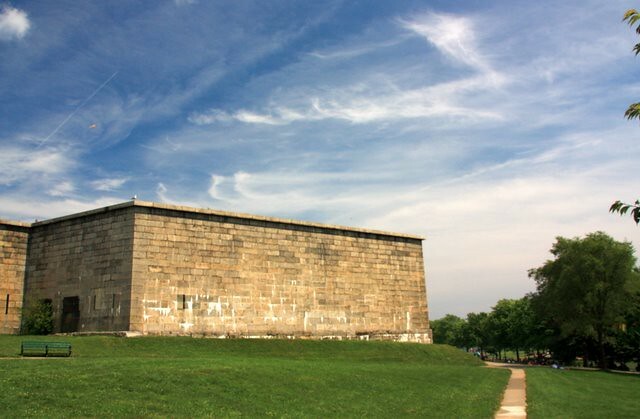 During one Monday share session following a gorgeous mid-May weekend, I described my visit to Castle Island in South Boston to a small group of sixth graders. 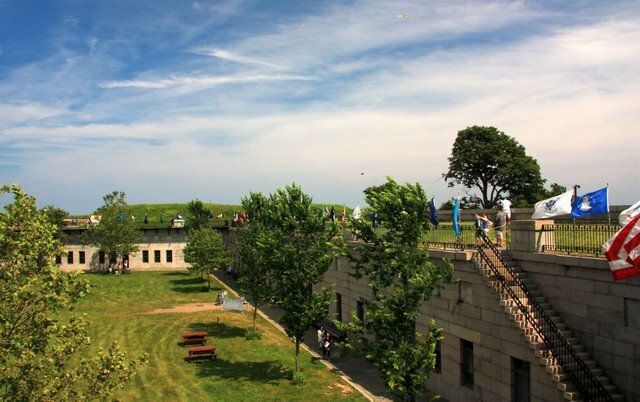 I had stumbled on a tour of the castle – an old military fort – led by a Southie native who proudly showed off the cannons, glorious views of the harbor and the flags that line the ramparts. The kids were excited to hear about this. One girl asked – Oooh did you see a princess? Another not so little boy asked – Did they have potato chips? 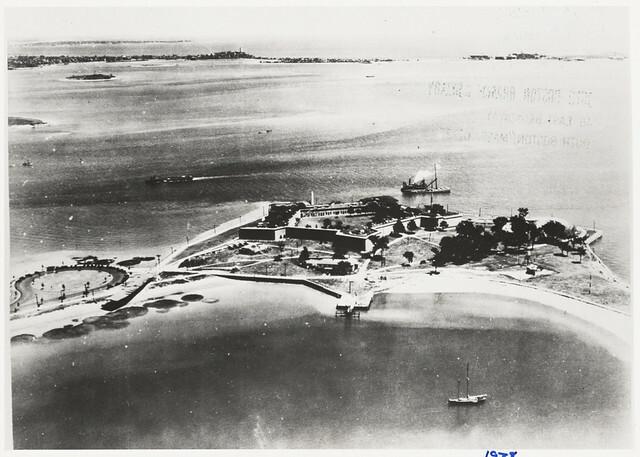 A bird’s-eye view of Castle Island. 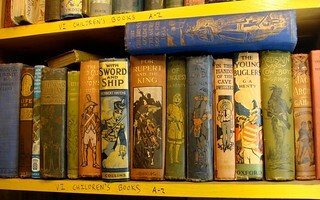 Photo credit: Boston Public Library on Flickr. These sixth graders have been to Castle Island many times and are quite familiar with the outside of Fort Independence. But they had never gone on the tour inside or learned that castle was built between 1834 and 1851 for military purposes. While the stone walls of a castle will remain unchanged for generations, the ways individuals and generations interact with it are nearly endless. Through the kaleidoscopic eyes of humanity, that stalwart South Boston landmark can be interpreted as a booty of potato chips or a genteel gathering of princesses. Outside Fort Independence on Castle Island. Inside Fort Independence. Photo credit: BostonPhotoSphere on Flickr. Oh how I wish that today’s curriculum developers and the obedient administrators and teachers who follow their scripted programs could see that the city – the always-evolving built environment – is a playground for kids’ imaginations. These days reading class consists of examining short, boring passages that highlight a discreet skill. One of the curriculum writers’ favorite skills is identifying the main idea. At my school we find the one main idea by chanting empty phrases like Jail the details, which really means underline important sentences. And when we’re done jailing details we chant slash the trash, which really means we cross out two of four possible answers to multiple-choice questions. Of course, the goal here is to train students to score high on high stakes reading comprehension tests. And taking those tests, as my principal told a crowd of cheering 4th, 5th and 6th graders, is the reason they go to school. Our children are going to school to read fake texts and then, usually through a multiple-choice assessment, identify the main idea of that text. It is no wonder kids don’t know how to read a book or a newspaper. Books are so yesterday. Reading comprehension worksheets and textbooks with scripted teacher guides are what’s happening. Last year teachers at my large urban charter school were discouraged from using class time to read books aloud to students. My principal certainly didn’t approve of reading the first two Harry Potter books to my fifth and sixth graders. My school is not alone. At the end of May I ran into a distraught reading specialist from a suburban public school who had tears in her eyes and desperation in her voice as she relayed that she had not been allowed to read one real book for the whole school year! Her entire year was devoted to test preparation. How will this affect our children? Don’t they deserve to read the fiction that lets their imaginations loose, the non-fiction that informs them about their world and the newspapers and blogs where they can practice formulating ideas and solutions? In other words, a chance to practice thinking? With a skills based curriculum the teacher is the focus of the classroom and the students are like empty bottles. There is no thinking involved. There’s tons of data, research and scholarly articles that prove that barely literate people are not able to contribute to society. Indeed, they are more likely to end up in jail, on welfare or victims of street violence. Reading is a sure path to freedom, especially for children whose options are already limited by poverty. Whether they are rural or urban, and no matter their race, reading is essential for delivering these children out of poverty where they can create a decent life. Data aside, I can tell you from personal experience that children approach books with a skeptical, detached eye. They simply don’t expect the words to make any sense. And they don’t know that expert readers go back and review when their comprehension has broken down. My kids just plow through the words as if they were running through thorny brambles, relieved and scratched when they get to the other side. When asked to summarize what they have read, my students will invent a new and unrelated story, copy random sentences or list reams of minor details. All last year, my fourth graders worked very hard at learning how to read and summarize authentic text. They did a fabulous job although there were tears, resistance and anger along the way. Never mind that the principal once observed that there was no evidence of teaching in my classroom because we weren’t working on the skills. Skills like finding the main idea. Let me shout to the throngs who spend sunny days at Castle Island and anyone else who will listen, “There is no such thing as a main idea!” One child’s castle is filled with potato chips and another’s is home to a princess. A+ my lovely children. Your main ideas of the castle are both 100 percent correct. “Jail the details”? Really? Who came up with that awful phrase? It sounds like someone wants to punish details, lock up details, eliminate details from life because they’re too messy. It really blows my mind that administrators, who were once teachers themselves, fall for this crap. I’m a bit surprised to hear that it’s happening in suburban districts too. I thought children of privilege were insulated but I guess no one is safe from the megalomaniacal effort on the part of both political parties and their corporate cronies to standardize childrens’ minds in the name of reform. It all really hurts. Keep on waving your banner in the name of authentic learning Nancy! Keep on speaking on behalf of children as human beings deserving of freedom of thought and expression! Nancy, this post terrifies me. I’m the mother of a 3-year-old who I’ve been reading to since before he could sit up. We buy all of our books at Goodwill or borrow them from the library so I don’t see reading as a matter of affluence. It’s actually dirt cheap, and bedtime stories are probably the most calming time of the day for both of us. Our parenting philosophy is to follow old-fasioned common sense. We are raising him the way that we were raised in the 70’s and 80’s with books, paints, superman capes, outdoor play of every kind, and yes sometimes even cartoons. It’s like there are no time-honored traditions around raising, caring for and educating our kids. All my husband and I want is a simple and solid education for our son, with the basics that will give him the skills he really needs (to read, concentrate, be imaginative…) and then give him a super long recess twice a day to run it off. It seems like this simple dream of ours has gone extinct for absolutely no good reason!